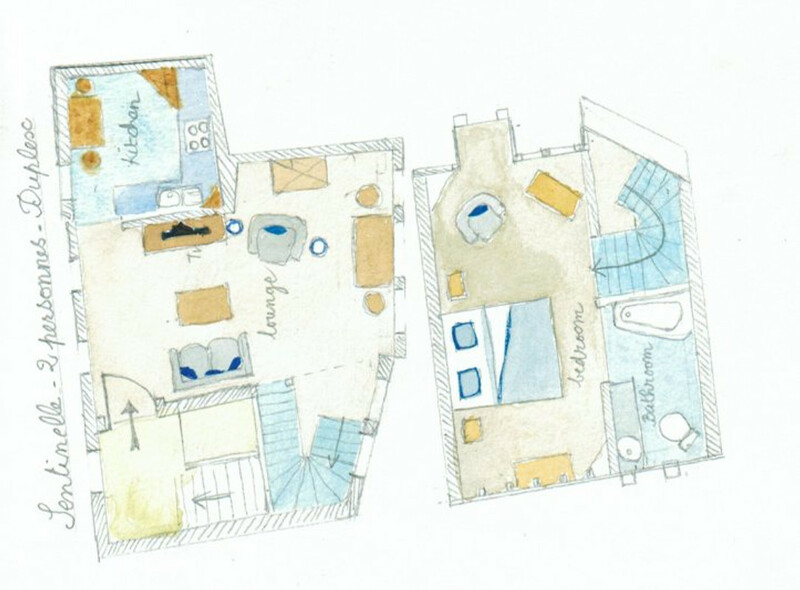 The Sentinel**** is a romantic apartment (50+ sqm). 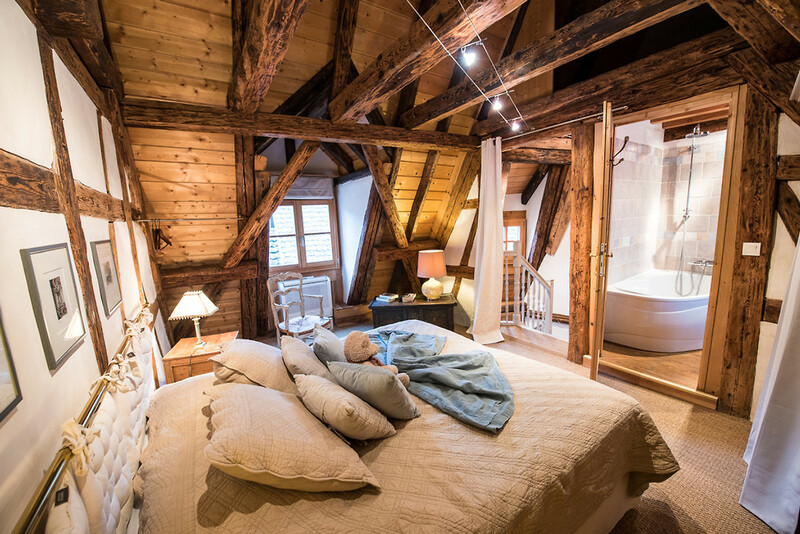 It is just coming out of complete restoration works and is welcoming its guests with an official 4 star comfort and decoration expertise both in restoration and decoration works (see our other places for rent in Riquewihr and near Paris) makes sure that it offers ideal self catering accommodation for 2 persons with great value for money: 1 couple in the double room + 1 extra person possible (grown up child only, no young children, no adult), sleeping on an extra bed in the lounge. 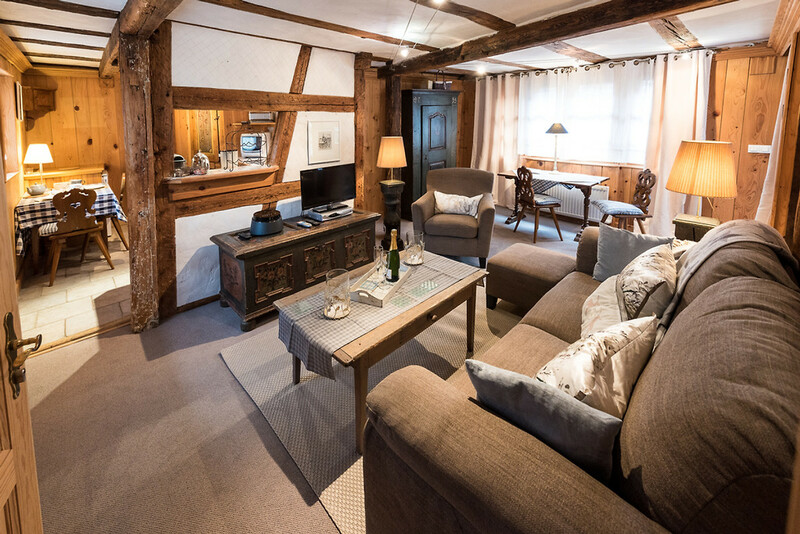 A romantic and elegant living space spreads over the first floor: lounge, kitchen and Alsatian 'stub' (dining area).This romantic flat is organised in a medieval house listed as a national heritage building (Monument Historique). 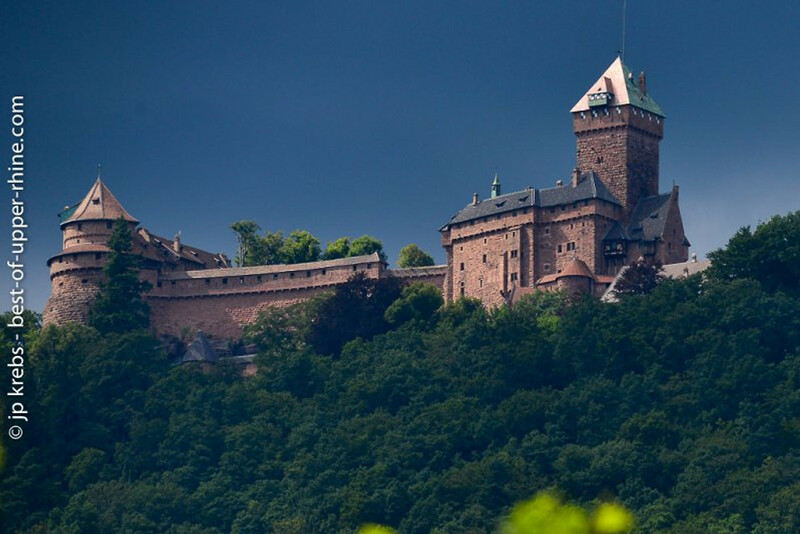 It is embedded in the medieval rampart (defence wall built 1500) of Riquewihr, only some yards away of the famous fortified gates of the Obertor and the Dolder tower. On the mountainside, the medieval city wall is the western wall of the house. On the street side, it is an Alsacian traditional half-timber framed house. 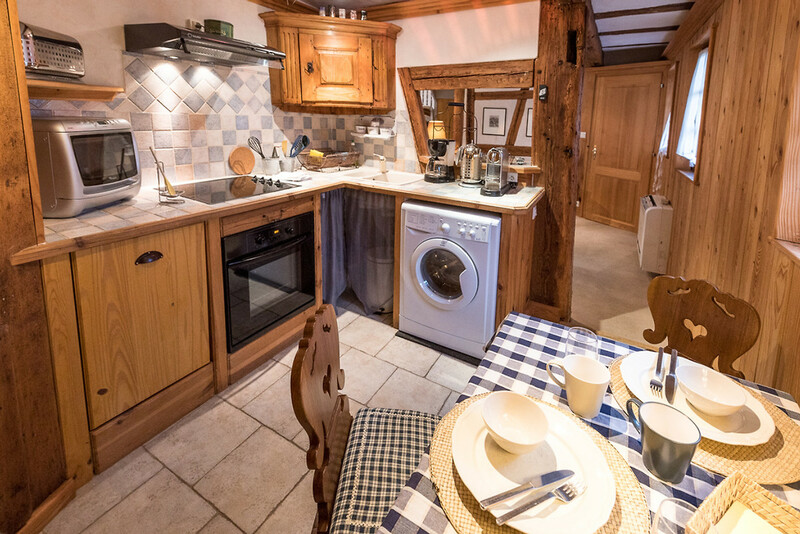 Decorated with great care and especially equipped for 1 couple looking for holiday accommodation on the Alsace wine route, at the foot of the Vosges and a few minutes of Colmar only. Some steep steps take you up from the street to the first floor, at the same level as the former covered defence way of the ramparts, where the medieval soldiers used to watch out for enemies, invaders or thiefs (therefore the name Sentinel)! The restoration works largely made use of the traditional techniques with organic and healthy materials (untreated wood, natural paintings with lime wash, no chemicals, etc). 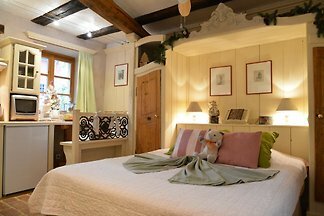 Authentic polychrome pieces of furniture and fabrics in Alsatian kelsch contribute to make this small house a real jewel. 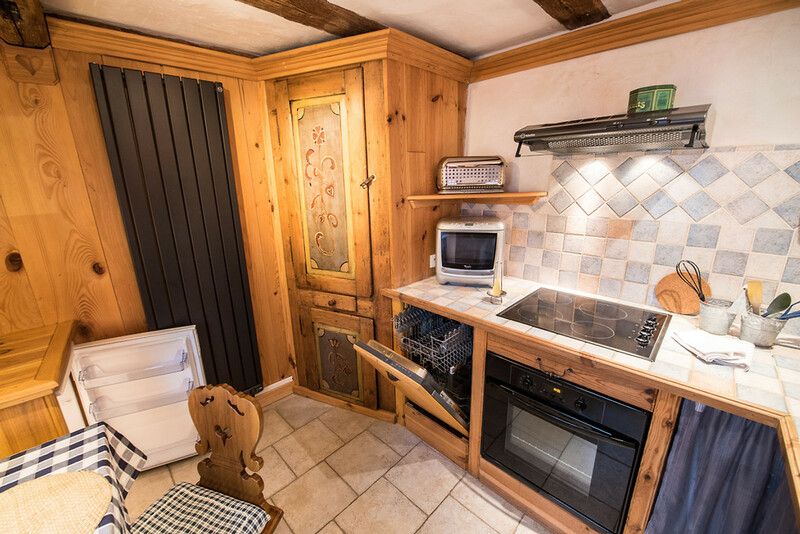 As we recently achieved it in the neighbour house this new flat combines charm and comfort and will be able to satisfy - Summer as Winter - those which appreciate and privilege before all the refined and authentic places… The fully equipped kitchen makes it possible to be perfectly autonomous. 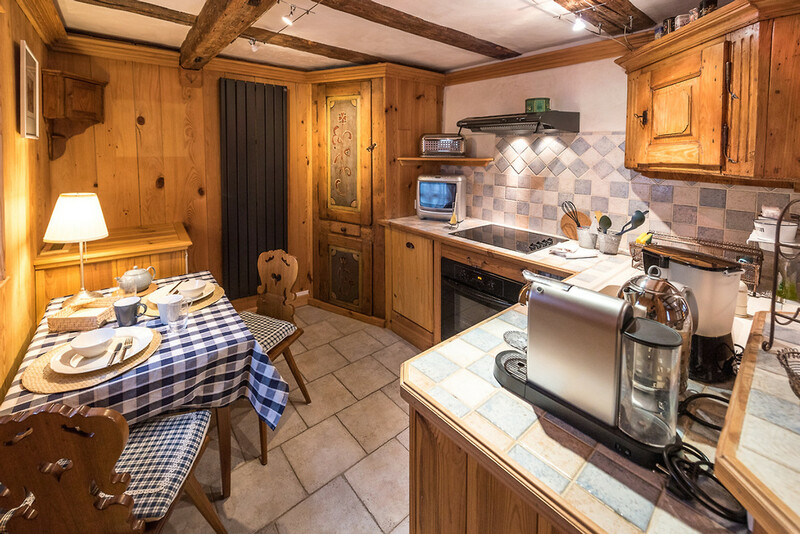 But do not forget that the many ones and excellent restaurants of the village (some of them being listed in the Michelin Red Guide) - with excellent value for money - are within walking distance. 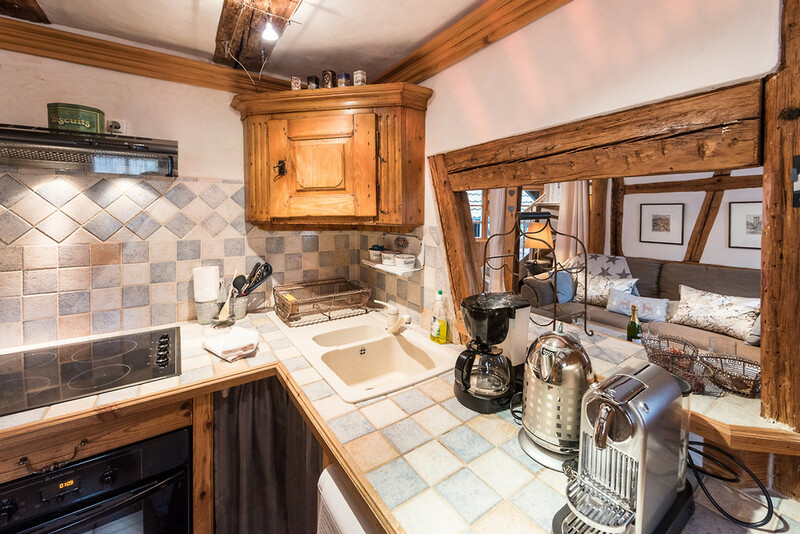 The Sentinel**** romantic flat is located in a medieval house listed as a national heritage building (Monument Historique). 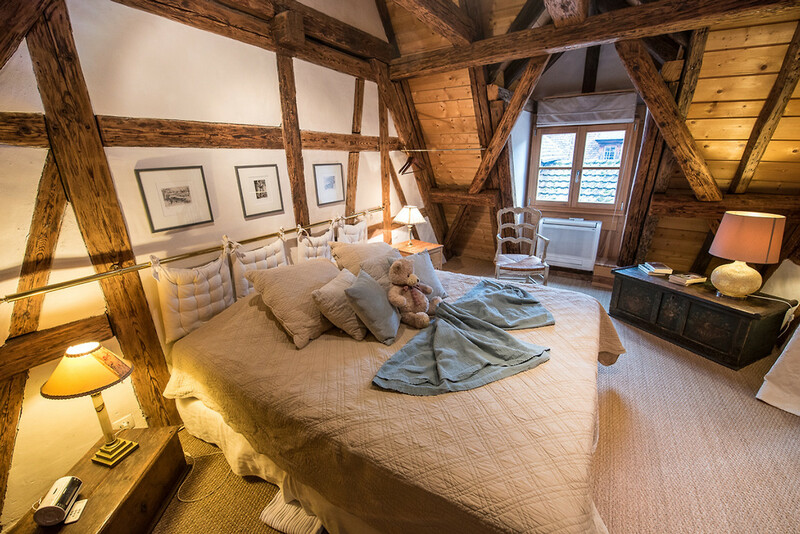 The apartment is embedded in the medieval rampart (defence wall built 1500) of Riquewihr, only some yards away of the famous fortified gates of the Obertor and the Dolder tower. On the mountainside, the medieval city wall is the western wall of the house. On the street side, it is an Alsatian traditional half-timber framed house. 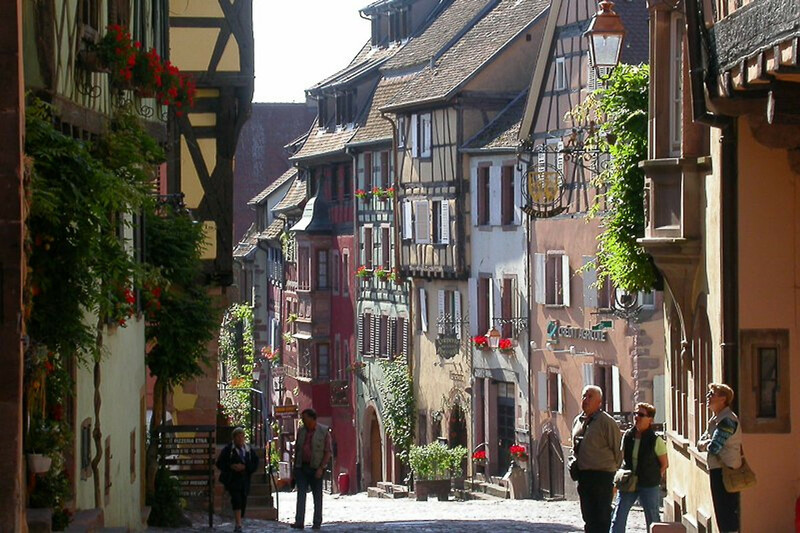 Riquewihr, a colourful village out of a fairy tale, hides in a small valley on the foot of the Vosges mountains, on the wine trail of Alsace, hardly a dozen kilometers from Colmar. 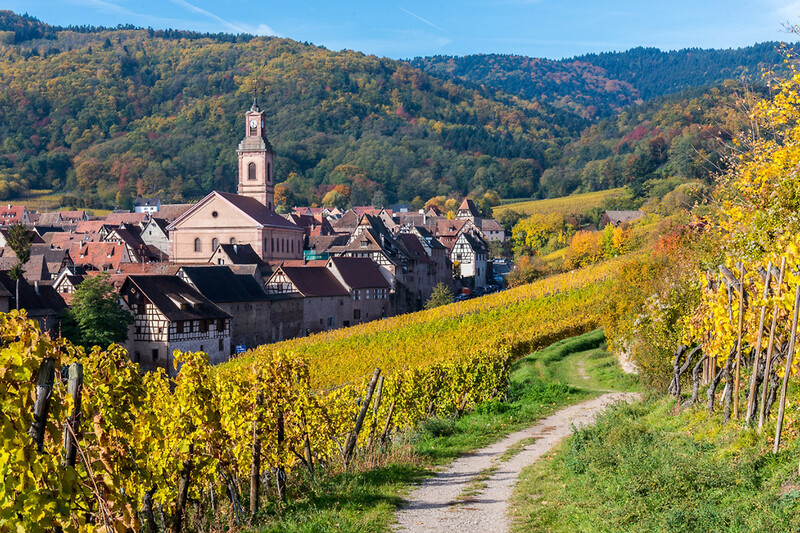 In Riquewihr you are in the middle of this so picturesque Alsace of the picture centuries, Riquewihr produces some of the most beautiful wines of Alsace and the world. 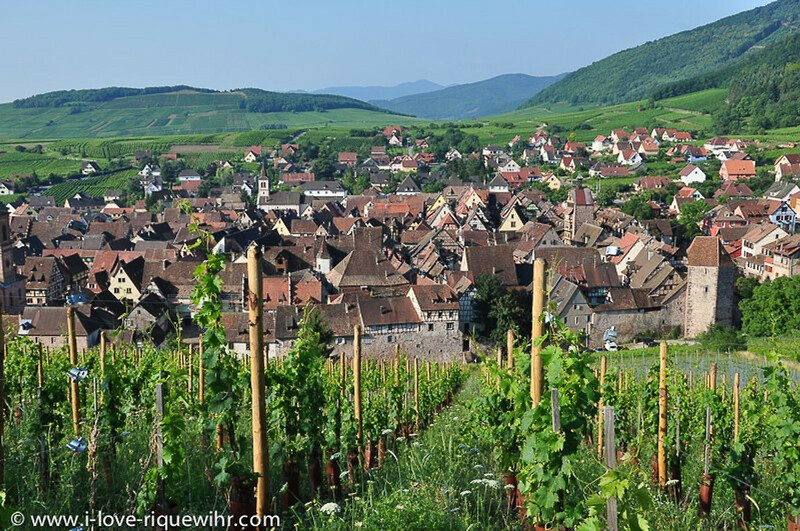 A nature superbly made up of vineyards and wooded mountains is protecting this exceptional jewel which is Riquewihr. 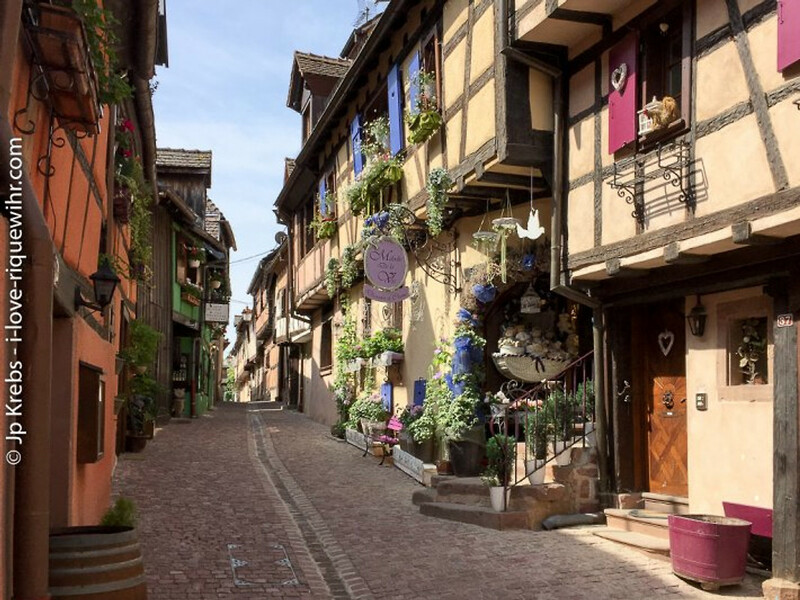 Ramparts, rich residences and more modest medieval houses make it the pearl of the Alsatian vineyard and one of the most visited and most beautiful villages in France. Best prices are obtained with stays of 7 nights and more. Minimum stay = 3 nights. 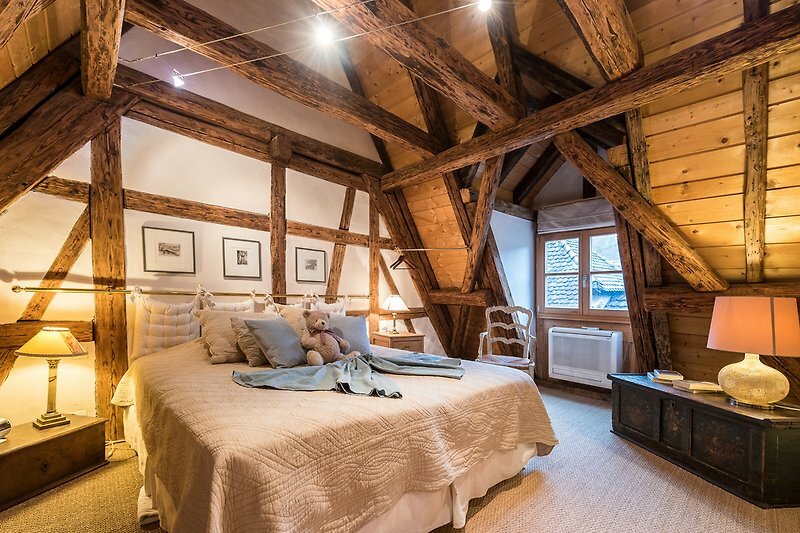 For your comfort and your health, we are creating and restoring our vacation rental apartments (also called gites in France) with healthy and organic components delivered by local craftsmen and resources. 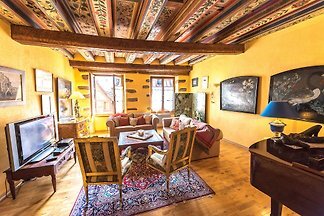 The wood panels on the wall of the Sentinel**** are created in the traditional local way. 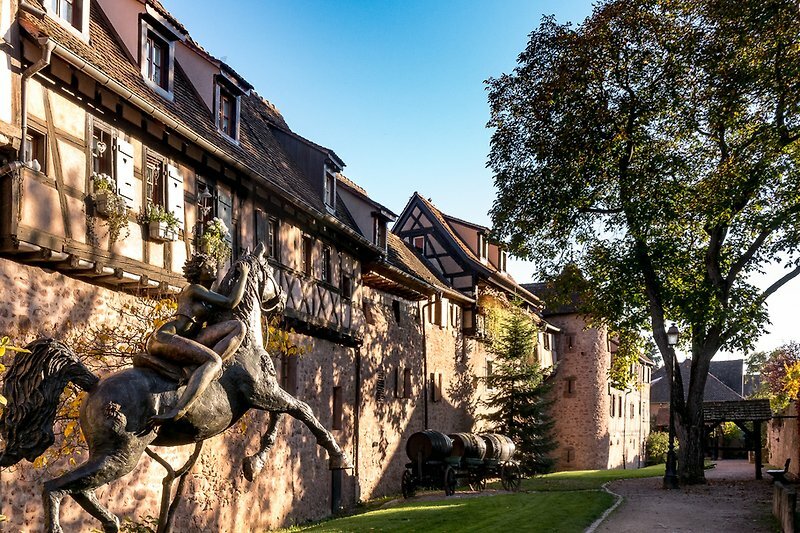 Wood is coming from the forests growing on the Vosges mountains above Riquewihr. As in old times, the woodden boards are of different widths, according to the diameter of the trees they came from. Before they were tinted, woods were nourished with a lasure made with plants. The paintings, waxes and oils we used are natural and carpets of the bedrooms is a weaving of wool and flax. When you will walk barefoot on the cork ground of the bathroom, you will feel warm. The fabrics - primarily of flax woven by hand - come for the majority from Gander Weavings close to Sélestat… The lamp-shades were handmade. Lastly, to restore this so particular Alsatian environment as well as possible, the pieces of furniture are genuine Alsatian antiques. In 2003, more than 12 years ago, we have received our first guests near Paris. 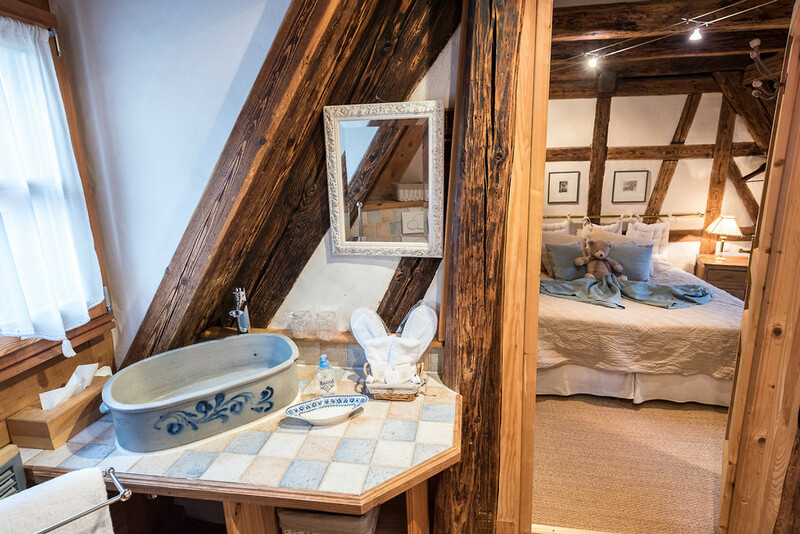 In 2006, we restored our first historic apartments in Riquewihr in Alsace. 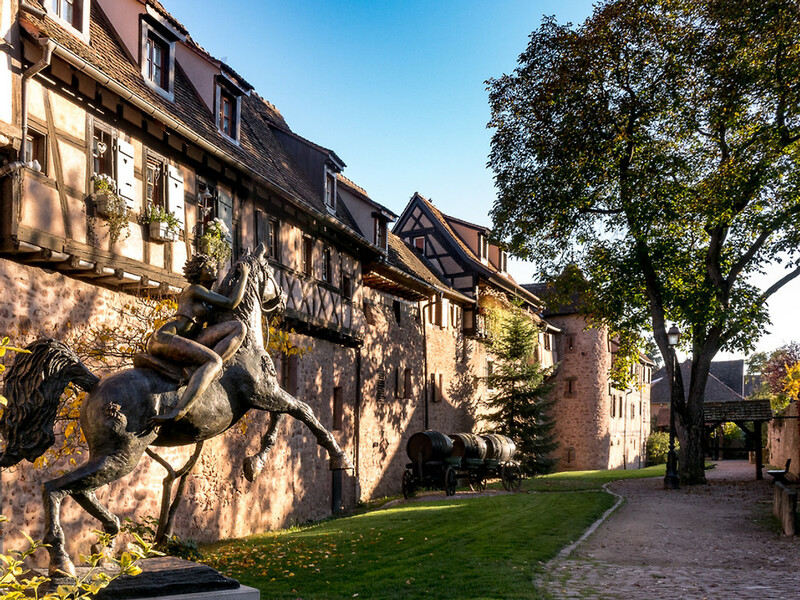 The guard in Riquewihr was newly built in of 2007. 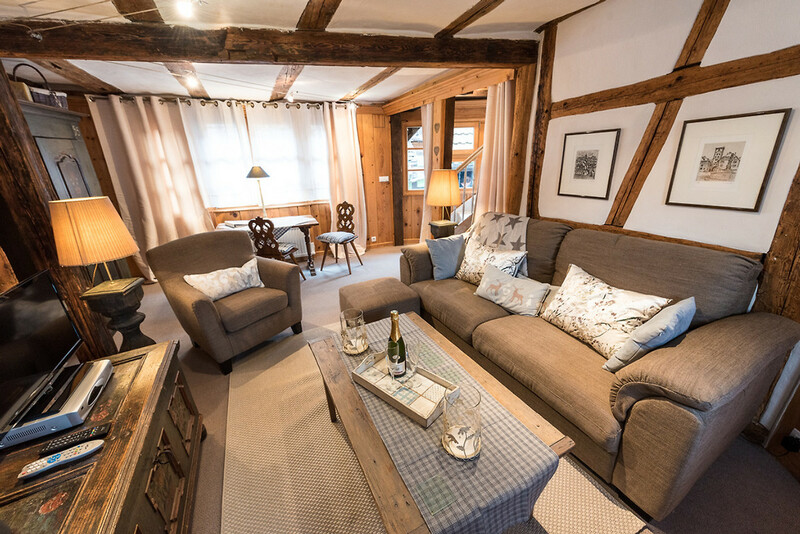 Over the years, we have created 15 apartments in Alsace. 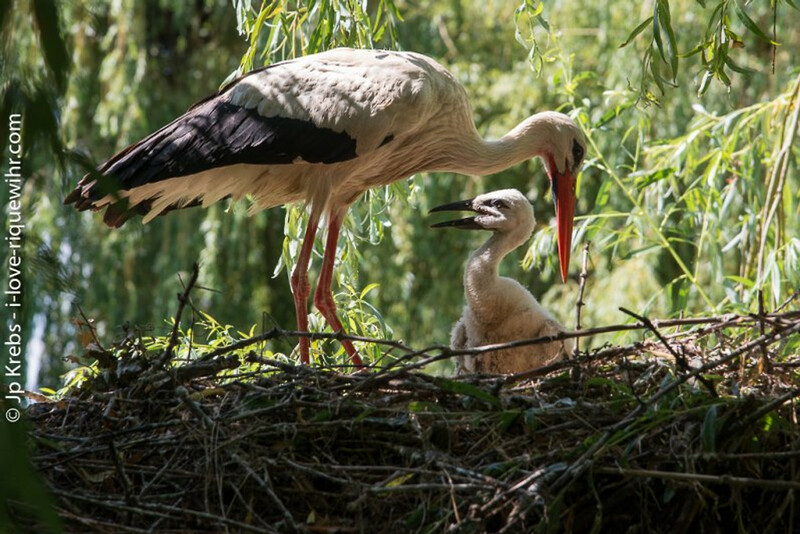 And in 2015, another first in the Mediterranean. free time activities: Ob mit oder ohne Auto - alles ist sehr gut erreichbar. 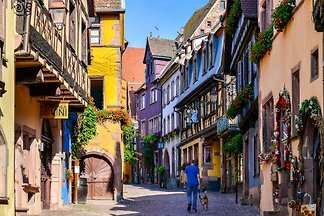 Ob ein Tagesausflug nach Colmar, Wanderwege, Burgen, Museen, die Umgebung bietet so viel, dass man den Tag entweder genau planen oder sich völlig entspannt auf Neues einlassen kann. Wir sind viel gewandert und haben vor allen Dingen die Natur, das Wetter und die herrlichen Aussichten auf den Schwarzwald und die Vogesen genossen. Sehr schön war der Storchen-Park in Hunwawihr - der je nach Geschwindigkeit in einem 45-Minütigen Spaziergang gut zu erreichen ist. 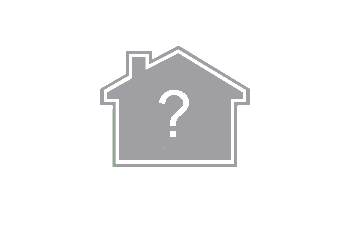 shopping facilities: 2 Minuten Fußweg von der Ferienwohnung entfernt ist ein kleiner Bäcker mit sehr gutem Angebot. 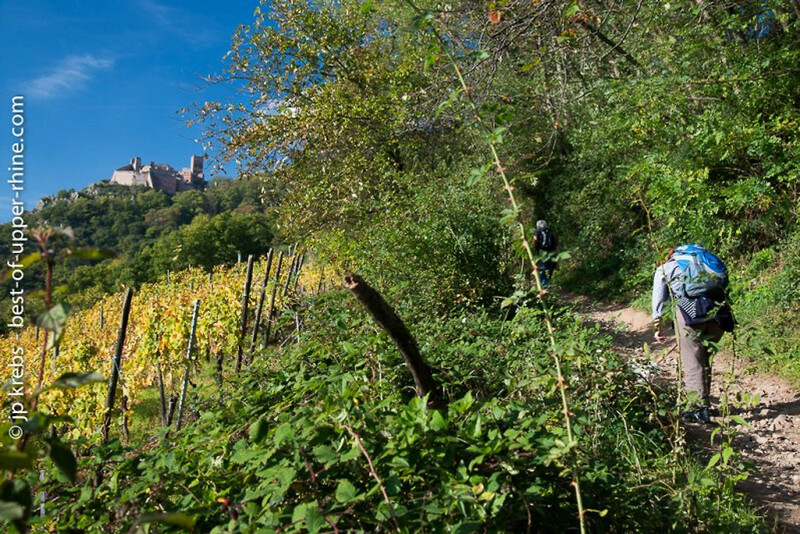 Zudem gibt es drei kleine Märkte in Riquewihr, aber natürlich auch mit entsprechenden Preisen. Wer einen größeren Einkauf tätigen möchte, dem sei ein größerer Supermarkt, z.B. in Houssen empfohlen, dies ist für den Geldbeutel deutlich angenehmer. Zudem liegt er direkt auf dem Weg nach Colmar und lässt sich mit einem Tagesausflug verbinden. 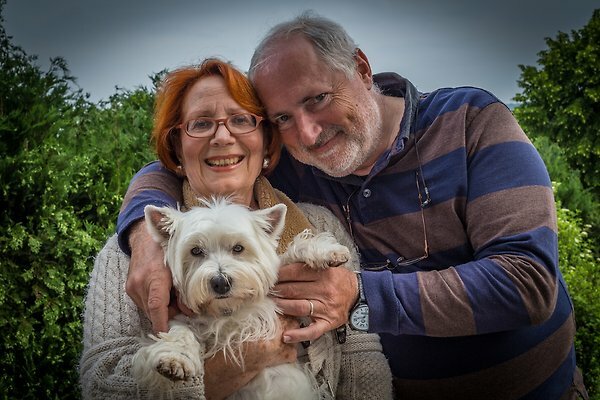 Schräg gegenüber der Ferienwohnung ist der Verkaufs- und Verkostungsraum eines Winzers, der sehr gute Weine führt, auch diese können wir empfehlen. free time activities: In der kurzen Zeit konnten kaum alles auskosten. Hier sind schöne Wanderungen und Ausflüge möglich.